Open Discussion → Would now classify as? An email was put in my regular inbox bucket and it was clearly spam based on the subject keywords. When I opened popfile ui to reclassify it, you could tell more words were highlighted in red for my spam bucket than inbox and it said this would now classify as spam. I'm just wondering how it seemed to have slipped through and why it would say that since I had not made any reclassification before I inspected that email. When you use Single Message View to look at a message POPFile re-analyses the message. I suspect your email client found more than just that one message when it checked for new mail therefore when you looked at the message in Single Message View the database was not in the same state it was in when POPFile first classified the message. This is why POPFile appeared to change its mind about this particular message. Since POPFile reports that the message would now be correctly classified there is no need to reclassify this message. 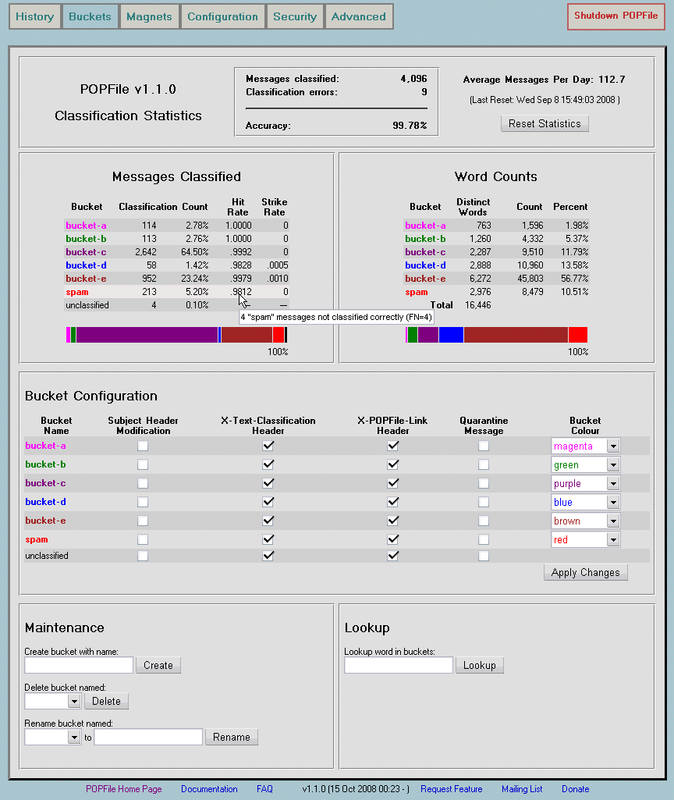 If you have not been using POPFile for long this sort of thing might happen again but as POPFile learns more about how to classify your mail it will become a rare event. I've been using pf happily for years so it was just surprising as I don't recall ever seeing that before. I was a bit surprised the first time I noticed this. It still happens to me now and again (once a year, perhaps - I don't keep a record). Oh you know what. I just thought of something. Up until a couple months ago I had still been using .47 so its possible that feature wasn't in the older version I was using. The database is updated only when a reclassification is done, doesn't it? No. The database includes more than just the corpus. For example the HISTORY pages in the UI are assembled using information retrieved from the database; this information gets stored in the database as each message is classified. So am I now that I have taken some more time to think about it! For several years my main POPFile installation has been a customised one and sometimes I have trouble remembering how the "official" version behaves. I am having to re-install everything after my hard disk failed so I am not sure exactly what changes are in my customised version. So far it seems that you are correct in thinking that the corpus does not get modified during normal operation. So my earlier "explanation" is, to say the least, not a very good one. I am quite used to strange things happening with my customised version but most of these glitches concern the UI so I was not too surprised by the unexpected Single Message View report. Perhaps that was a mistake?